Two parables are in today’s Gospel reading: the invitation to the wedding feast and the wedding garment. The first parable suggests that the Kingdom of God will become known whether people are ready for it or not. It is God’s gift, and all sorts of people will be included, though many may not be worthy by the standards of the world. The second parable reminds us that we must be ready for the King at all times. His invitation comes unexpectedly. 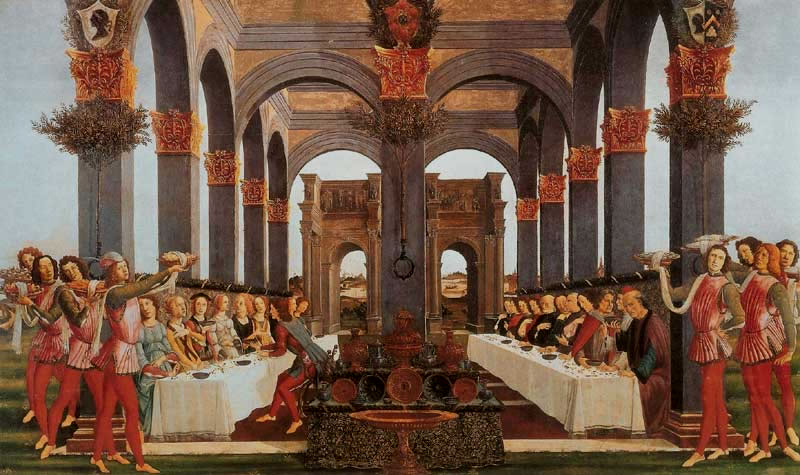 In Jesus’ time, a royal marriage feast could last for several days, and so, as was the custom, the king could send his slaves to remind the invited guests that it was time to come. When they did not arrive, in today’s parable, the king sent more slaves to compel them to come to the banquet. However, the guests still refused to come; they “made light” (Matthew 22:5) of the invitation. Some went about their usual occupations of tending to their farms and businesses, but others killed the kings’s slaves. God’s kingdom is offered to those who are able to respond to the invitation, both good and bad. The harsh treatment of the guest who comes improperly attired warns the Christian community against a complacent attitude about what is required for a welcome in God’s kingdom; those within the Church are also subject to judgment. Those God uses are often the most unlikely candidates for service. And if we do not heed the call, God’s work will be carried out by others. Failure to wear an appropriate garment to the wedding symbolizes neglecting to behave in a manner befitting God’s standards. This points to the necessity of being prepared to answer God’s call – to model true discipleship and reflect life in God’s Kingdom. In the final verse, Jesus proclaims that “many are called, but few are chosen” (v. 14). All are called to the unity and fellowship of God’s banquet, but not all will pass God’s judgment. Being invited to the celebration does not guarantee being allowed to stay. Final inclusion in the Kingdom involves being prepared to share fully in God’s life. It is often said that the Holy Eucharist is a foretaste of the “messianic banquet.” Jesus may have been referring to his coming banquet when he said, “For I tell you that from now on I will not drink of the fruit of the vine until the kingdom of God comes.” (Luke 22:18). You that do truly and earnestly repent you of your sins to Almighty God, and be in love and charity with your neighbors, and intend to lead a new life, following the commandments to God, and walking from henceforth in his holy ways; Draw near, and take this holy sacrament to your comfort; make your humble confession to Almighty God, and to his holy church here gathered together in his name, meekly kneeling upon your knees.” “Invitation to Communion” from The Book of Common Prayer, 1549. Christians extend the invitation to the banquet in their regular participation in worship and in their involvement in congregational ministry and life. In what forms does God’s invitation come to people today? What is the role of the Church in issuing God’s invitation? What is response to those who are told to be “properly dressed” for participation? What are some of the distractions in your own life that interfere with your call from God? What do you need to do to eliminate them? What is the different between being called and being chosen? How have you been both called and chosen? Jesus says that the Kingdom of heaven is like a wedding banquet (v. 1). What do you think Jesus wanted his listeners to understand about God and the Kingdom from this parable? This entry was posted in Book of Common Prayer, Education, Eucharist, Ordinary Time and tagged Book of Common Prayer, Jesus, Kingdom of God, Parable. Bookmark the permalink.